Riding in San Antonio is pretty much like Austin and I don’t know if it’s the Lance halo effect or what, but the people we met were very nice to cyclists, even giving us a ton of room on the road. When the Modal was built, we also converted Pam’s Davidson to S&S, and this was our first trip with them. We wanted to spend time with the bikes, assembling, learning how to do it, but two late meetings later and a couple business crises, we were slamming them together to get out and ride. And it went pretty well. Pam’s bike took about 1/2 hour and the Modal was about ten minutes less because of the single speed configuration. We both struggled with the chain master links. Probably some secret bike shop knowledge we haven’t been blessed with yet, but after several tries and techniques, we got chains on both bikes. As I noted in my comments on another Modal post, riding a single speed is liberating. Where we had to stop several times to adjust Pam’s derailleur and fiddle with the master link, I was set. 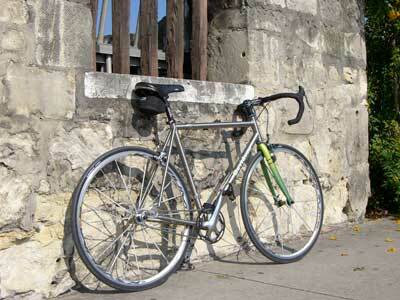 The Modal at the Alamo. Note: The modal is a travel bike concept that folds and toggles between single, fixed, and geared modes. The Modal is my third Davidson and besides the modes, Mark V designed it as a straight-up road bike. It’s the stiffest Davidson I’ve ridden and that translates into “a quickness” and reassuring agility. I expect when I ride the bike in geared mode, I can make it go real fast. I don’t know specifically if the S&S couplings make the bike stiffer, but there was not a noticeable difference from a bike without couplings. Of all the bikes I ridden, I’ve always thought a titanium frame with a carbon fork is the best combination for ride quality. I like the feel of the road under me, the springiness of ti (not flexy) and the all-day comfort. I’ve toured and trained long hours on my ti rain bike. Mark can add more about the subtleties of the Modal, geometry and other choices he and Bill Davidson made, but whatever they did, it resulted in a performance bike for travel. It’s exactly what we wanted the Modal to do. We rode the Missions ride noted here, which is a combination of wide roads with bike lanes, a National Park for the 3 Missions, and a bike path. It’s not well marked, but with the help of the locals, we found our way and rode all the way to Lake Braunig and back. 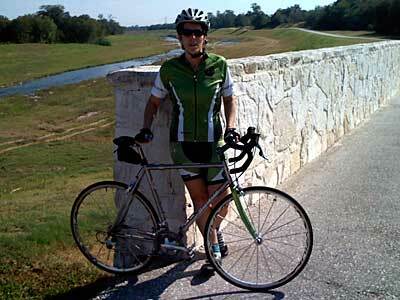 Pam is shown here on the river bike path. This path follows a centuries old aqueduct system that’s still in use today.